Infection Risk and Limitation of Fundamental Rights by Animal-To-Human Transplantations. 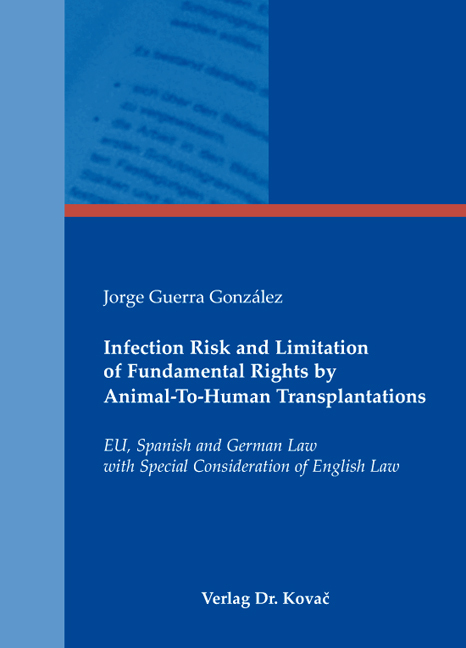 Forschungsarbeit von Jorge Guerra González, Verlag Dr. Kovač 2010, 134 S.
Animal-to-human transplantation (xenotransplantation) is a viable hope for the health and even the lives of thousands of people. However, the therapy involves many ethical and legal problems, the most significant of them being the xenogeneic infection risk. It concerns the development and transmission of new diseases derived from animals. This is a real possibility that cannot be ruled out, considering that AIDS, Ebola, or the A(H1N1) influenza are all human diseases of animal origin. This legal report shows ways to face such risks, mainly regarding the graft recipients. The points of view of the Spanish, German, and English legal systems are analysed, as well as the context of EU Law. The background consists of a cardinal subject: the conflict between the interests of the individual and of society, i.e. when and how the state is allowed to constrain fundamental rights in order to protect public health from infection risks. The relevance of this analysis goes beyond the limits of xenoÂ­transÂ­plantation, and it will gain further importance with future developments.